A Capoeira class is an hour like never before experienced. The workout has been super, sweat dripping from the brow, and the time just flew by. Read More! A fitness regimen that combines all the components of physical fitness is finally available. 1 Moore Rep Fitness Studio has designed a challenging, attainable program to improve cardio vascular endurance, muscular strength and endurance, healthy Body composition and flexibility. Read More! Sunshine and a soft breeze, wine and the mellow sounds of jazz offer the makings for a fun-filled Saturday at Torii Beach. 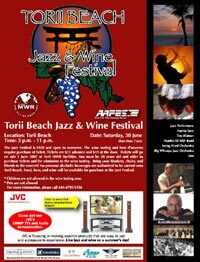 Army Morale, Welfare and Recreation is hosting the Torii Beach Jazz and Wine Festival next weekend. Read More! Congratulations It’s a girl! Jubilant officials at Okinawa’s Churaumi Aquarium are heralding the first ever birth of a manta ray in captivity. It’s a monumental feat, never achieved anywhere in the world before, and comes nearly 19 years after the aquarium began trying to breed the Mantra birostris. Read More! 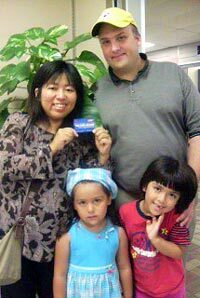 Ling-Huey Carter is this week's winner of a ¥5,000 gift card to Anchor Shoji a specialty shop for kitchen utensils. She is from Hawaii and has been on Okinawa only two weeks. Read More! The concessionaires currently providing services at the Kadena Marketplace, Bldg 409, will close business there June 30 in preparation for the new BX and Commissary shopping center construction. The personal services and concession activities sponsored by the Army and Air Force Exchange Service will relocate to the new, temporary Kadena Marketplace, Bldg. Read More! Even as controversy over the end days of the Battle of Okinawa is rekindled, thousands of survivors of the fighting will gather Saturday to pay homage to those who died. The bloodiest battle of World War II, the Battle of Okinawa ended with more than 12,000 Americans and 107,500 Japanese troops killed, along with at least 42,000 Okinawa citizens dead. Read More!